After almost 4 days of only having talked to Palestinians, or Israeli which were critical of their own politics, we went to the Jewish settlement Alon Svut in the westbank. Maybe not the best timing…. But maybe also not bad to see a total juxtaposition of viewpoints. When we first came in, it felt like one of those holiday resorts like Center Parks. Totally fabricated and disconnected to reality. The Rabbi of the settlement gave us a little tour and history of how the land (of course) had always been theirs, and how they had fought to obtain the land back. 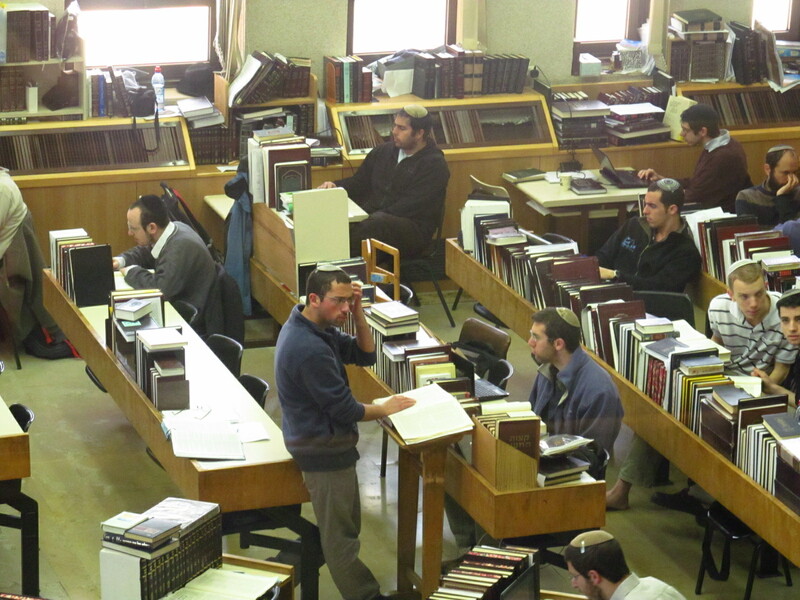 He showed us the Yishuv, a sort of thora-university, where students sit in a space together all day, 5 years long, reading the holy scriptures and arguing with each other about it. Quite peculiar. This settlement was, interestingly enough, one of the settlements surrounding the Tent of Nations, the Palestinian farm surrounded by settlers that we had visited before. Unfortunately we didn’t really get an opinion of the Rabbi on how this settlement felt about the Nasser Family and their right to land. He kind of avoided talking about it. According to the rabbi, the settlers live in peaceful coexistence with the arabs around the settlement, and he educates his children that Palestinians have the right to live there. At first I thought, wow, what a rational, moderate rabbi! How is it possible there is still this conflict going on when all the people we meet are so conflict-avoiding and peaceful? But when we started digging deeper, his views weren’t as moderate as he himself thinks they are. His perception on “rights” of the Palestinians is totally different than ours, since in general he considers the entire westbank to be Israeli territory. They refuse to call it “the West Bank” by the way, since it’s the land of Judea and Samaria, and the Westbank is a construct. Arabs can live there, as long as they don’t bother the Israeli, or when they want to expand the settlement, the Palestinians should move, because the land was given to the jews according to the bible. He doesn’t think the settlers should get out of the land since he thinks it won’t help the conflict. He used the example of Gaza, the territory of which Israel disengaged in 2008, closing the door behind them, not letting anyone in and out anymore. According to him the Gazans could’ve had paradise on earth in Gaza but instead they just started rocket launching attacks on Israel. Completely oblivious of the living conditions in Gaza of course and the fact that there are 1,5 million people squished together on a 42km long, 12km wide territory. We also got an entire powerpoint presentation on “walls in the world” that would justify the Israeli wall. It was very frustrating to sit there in this rabbi’s home with our group of 20 people listening to his short sighted views without being able to argue with him, yet I do think it was very useful to hear the settler’s perspective too, as much as I disagreed with it. 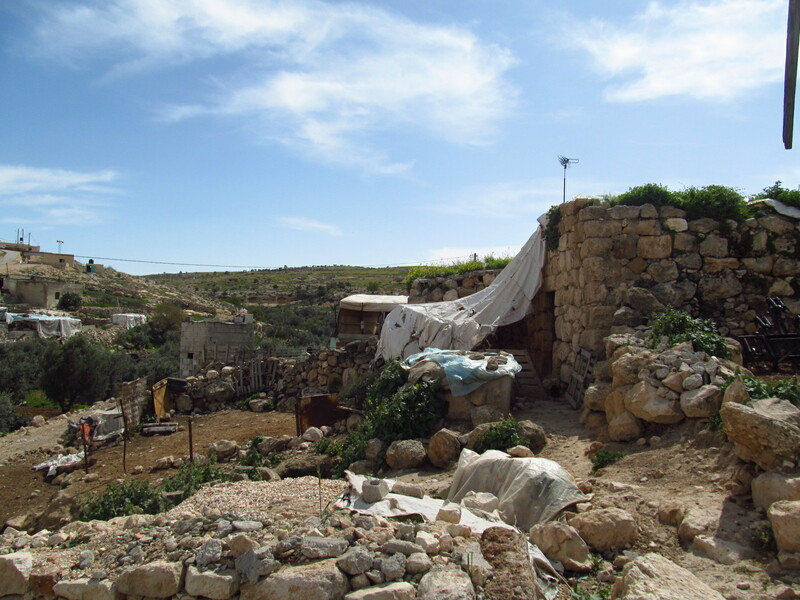 In the afternoon we went to At Tuwani, a small poor Palestinian shepherdvillage in the C-zone. Apparently the villagers being harassed often by the settlers, and when the children go to school outside the village, they often get attacked by settlers who newly set up camp in the woods. I don’t really have a lot to say about this village. Yes, it was poor, but they seemed to kind of link it to the settlers, while these type of villages are generally poor, conflict or not. There was also an activist organization of Italians, operation dove, who were there to capture every harassment of settlers against the village on camera and put it on youtube. Most of the stories they told us though happened a few years ago. The worst harassments happened mostly during the intifada. The children now even get protection from IDF soldiers when going to school (even though they should rather fix the problem than cure the symptoms…). I really lifted an eyebrow when our coordinator told us that a domestic violence is quite a big problem in At Tuwani. The Italian activists there kind of ignored this, because it’s not the purpose of their presence. This is something I think is important to comment on, which might bring out my supercynicalness again. Being apologetic for internal human rights violations to obtain other goals is something that delegitimizes supporting the Palestinians in their struggle for justice. You have to be critical to all parts, and not just excuse ‘minor’ injunctions of Palestinians for the bigger picture. This is measuring by two standards, and is unfair towards the Israeli too. You can’t say they are the ones doing everything wrong, and Palestinians are forgiven for not caring about human rights (rights of gays, atheist, women,…) just because they’re the weak underdog. That evening we slept in Haifa (Israeli harbour city), but before that we were supposed to go for a drink with the students of Haifa University in the evening. When it comes to the settlements, I heard some say they should just clear out ALL the settlements in the Westbank and the conflict would be over. I’m not sure I agree on this either. We’re talking about a quarter million settlers by now. People that have built cities inhabiting 100.000 people, kids that also grew up there and would get to hear that they’re being evicted because their parents or even grandparents were doing wrong things… moving all those big settlements i an equally inhumane solution as evicting Palestinians. Most arabs didn’t really seem to mind living with settlers, they just care about their agressive attitude and them taking more and more land, and just want justice to be done, in whatever form. But maybe I’m this time a bit too naive that they could all just live together in peace. Another solution would be to make an agreement on trade of territories, making those settlement zones official Israeli territory (instead of occupying the territory that ‘belongs’ to the Palestinians). The problem is just that Israel doesn’t know what territory to give in return. The arabs villages under Israeli rule don’t feel like moving to Palestine rule either. They’re perfectly happy where they are… and making 1 state of course defies the purpose of a Jewish state, since it would no longer be predominantly jewish… so yeah, this is one of those things I learned from an Israeli perspective, in a nutshell. We were having some conversations within our group about the idea of a confederal model. Both would keep their own rule of their people when it comes to cultural affairs, but the territory would be ruled mutually, a bit after the Belgian model. Everytime I mentioned this idea though, people would just laugh and say “so how’s that working out for Belgium?” since we’ve been having some existential crises. It could push aside the conventional two-state – one-state gridlock, but yeah. Who am I to start telling these people how to rule this ridiculously complicated conflict. Those last 2 days not a lot (in my opinion) happened anymore, I just gained more insights by talking with people. I apologize in retrospect for those that are not interested at all in reading my all ideas but just want to know how my trip was and what I saw; this was most of the entire trip; an experience with diversity and conflict. There was no real goal of the program. So naturally I feel the need to share those insights I have gained, since I have nothing I can use them for… except for sharing. 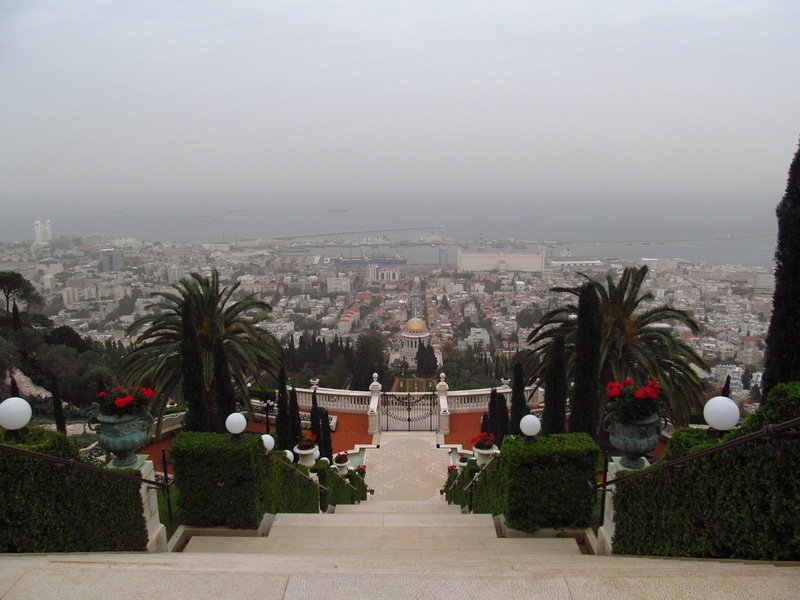 We spoke with an organization that wants to bring arabs and jews living in Haifa closer together through activities. Quite similar to projects everywhere in the western world dealing with multicultural societies, although it was interesting to see how Israeli cope with those arabs living in Israel. The conflict seemed a lot less prominent in Haifa though, yet we also weren’t in a bubble like Tel Aviv. Those that don’t mind living with arabs go live in Haifa, I quite liked it. Since it was Friday evening, it was also the beginning of Sjabbat. An orthodox jew and his wife were happy to celebrate it with us. Some singing, wine and a lot of explanation about tradition befell upon us, I enjoyed experiencing the tradition. We had some nice beers with the entire group, and finally felt like we could relax a bit. It had been such a mentally draining trip. had lunch at Raymond’s house, a friend of the coordinator and peace activist who welcomed us in his home, and we went to an old town close to Haifa before driving back to Tel Aviv to catch our flight the next day. I went through it in a blur. Normally we would’ve had students of Haifa spending the entire weekend with us, making it more exiting, but in the end only one joined, an American who had emigrated to Israel 4 years ago. It was interesting though to have him with us and see his perspective on things. He was an outsider compared to those that lived their entire lives in Israel, wasn’t as emotionally blind for some things, but had a good view on the ins of Israeli society. He was very critical of Israeli politics and the injustice done to Palestine, but at the same time the occupation didn’t delegitimize the right for the state of Israel to exist according to him. I agreed with him, and could understand a bit better how it must feel to “belong” somewhere, something all jews probably go through when they come to Israel. Our last night in Israel we went out of course. 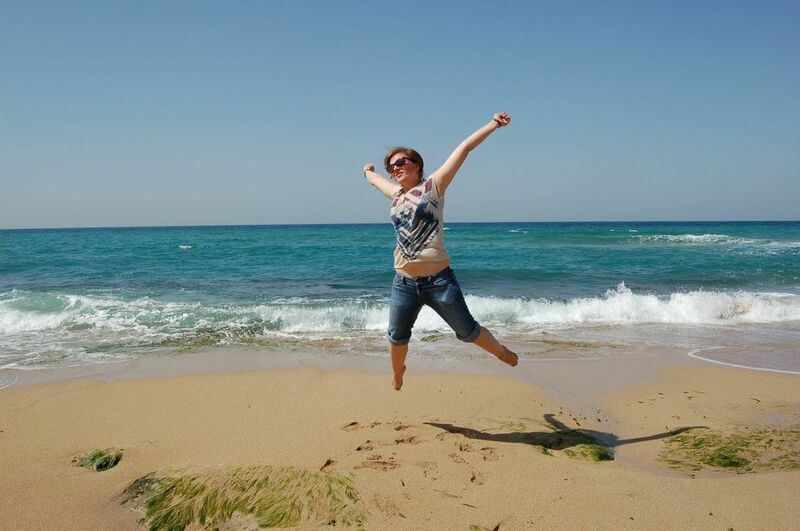 It was also the first time we came into contact with people that did not know in advance we were on this studytrip. The question “what are you doing in Israel?” was like this bomb dropped everytime, which felt very difficult to answer without unravelling into an entire discussion of an hour. Israeli generally think that if you’ve gone to the west bank, you’re judging them and don’t like the state of Israel. They’re prejudice about you being prejudice. Our trip was a hell of a lot more nuanced than that, but try explaining that in the line for a club. The answer “we’re here to party” was just easier to not start a discussion… but it did feel uncomfortable to lie about this. I feel like it will not be the first time I will have to twist myself in a bunch of corners, and will lie just to not start an entire discussion. Having a nuanced opinion on Israel is impossible without having to explain yourself for an hour. I don’t have any end remarks on this trip except for being happy to share my experience, which comes with a general feeling of impotence of not being able to do anything with it. Thanks for reading, and a special thanks to the entire group of fellow travelers that made this trip 10 times more special to me! Nu da uw kijk ook veranderd is tov vroeger, it has got to be even more interesting.